Following the recent speculations concerning Manchester United Anthony Martial’s possible exit from the club, there have been questions and rumours when the player was missing from the squad to represent United in the final pre-season match in Germany. Speculations have continued to make rounds about the possible transfer of the French international before the end of the transfer window. Meanwhile it is rumoured that Martial will probably transfer to Bayern Munich for a swap deal for Robert Lewandowski. The 22-year old forward left United pre-season US tour last week to attend to the birth of his son in Paris making him miss three matches. Manchester Evening news reported that Martial defaulted in returning to United’s Carrington training complex since last week but returned this Thursday indicating that his partner Melanie da Cruz had been unwell. Though, he wasn’t spotted by photographers at Manchester Airport with the rest of his teammates on Sunday morning. 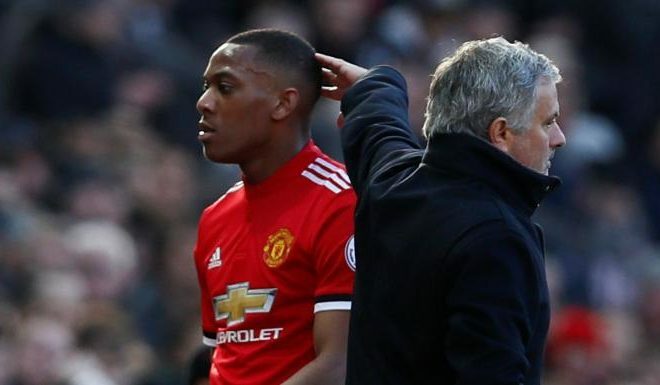 Concerning Martial possible exit from United, his agent make it clear in June that the French international would love to leave the club and Coach Jose Mounrinho is open to sell him but that decision isn’t left for Mounrinho to decide but his superiors that might not want to cash out a player they bought three years ago with a price on the high side worth £58million. Martial has been heavily linked with a move to Chelsea and Tottenham.